Royalty Aditya Pratap Singh alias Saheb (Jimmy Shergill) neglects his depressed wife, Madhavi (Mahie Gill), and keeps a mistress (Shreya Narayan). Things get complicated when a young man, Babloo (Randeep Hooda), enters their household as Madhavi’s driver and has a secret affair with her. 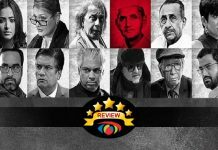 Read the review of Saheb Biwi Aur Gangster for more. Star cast: Jimmy Shergill, Mahie Gill, Randeep Hooda, Shreya Narayan, Vipin Sharma, Deepal Shaw. What’s Good: The actors’ performances; the excellent dialogues; the twists and turns in the drama. What’s Bad: The depiction of women in bad light. Verdict: Saheb Biwi Aur Gangster is entertaining but it has its share of flaws. It may work in U.P., Bihar and other parts of North India but universal acceptance is ruled out. Watch or Not? : Watch Saheb Biwi Aur Gangster for Jimmy Shergill’s extraordinary performance and the wonderful dialogues. Brandsmith Motion Pictures, Bohra Bros. Pvt. 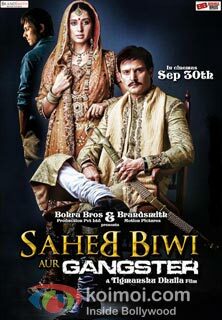 Ltd. and Tigmanshu Dhulia Films’ Saheb Biwi Aur Gangster (A) is a story of power, lust and betrayal. Aditya Pratap Singh alias Saheb (Jimmy Shergill) belongs to a royal family. His wife, Madhavi (Mahie Gill), is on heavy medication and sedatives for a mental problem. The wife is sad because Saheb doesn’t have time for her. She is aware that he has a mistress. Mahuva (Shreya Narayan), the mistress, is insecure about her position in Saheb’s life. Saheb has several enemies who are thirsting for his life. Saheb himself has eliminated people who’ve come in his way. Genda Singh (Vipin Sharma) plants Babloo alias Lalit (Randeep Hooda) in Saheb’s life so that he (Babloo) can keep informing him (Genda Singh) about Saheb’s personal and professional moves. Babloo, in return, is assured of acquittal from a criminal case against him. Babloo easily slips into Saheb’s life as he joins him as Madhavi’s driver after injuring his own uncle, Sundar (Sitaram Panchal), who works there as a driver. Even as he leaks information about Saheb to Genda Singh, Babloo has a torrid physical affair with Madhavi who also lusts for him. Soon, Babloo is caught spying on Saheb but he wins the latter’s confidence after apologising. However, he keeps leaking information about Saheb to Genda Singh and also continues his physical relationship with Madhavi. Soon, Babloo becomes over-ambitious and wants to get closer to Madhavi. He decides to have Mahuva eliminated, in keeping with Madhavi’s whim. He also wants to remove Saheb from his way so that he and Madhavi can live happily ever after. Does he succeed in his mission? Does he have the support of Madhavi in carrying out his evil plans, part of which is Madhavi’s own brainchild? What happens to Genda Singh? Do Babloo and Madhavi finally live happily ever after? Does Saheb prove one-up on them? Answers to all these questions are revealed in the culminating part of the drama. Saheb Biwi Aur Gangster is a story of power, lust and betrayal. Sanjay Chouhan and Tigmanshu Dhulia’s story has a lot of twists and turns, which keep the audience’s interest alive. The many layers in the story keep unfolding in an interesting manner, keeping the viewer engrossed. What adds to the drama (also penned by Chouhan and Dhulia) are the wonderful dialogues, penned by the writing duo. The dialogues, mouthed by every character in the film, are so interesting and entertaining that they become the film’s mainstay. However, they can’t erase a couple of drawbacks of the screenplay which stick out like a sore thumb. For one, Babloo’s plan to have Saheb to kill Mahuva becomes redundant when it is shown that he also plans to have Saheb himself killed. For, if Saheb is going to be eliminated, it hardly matters – to both, Madhavi and Babloo – whether Mahuva is allowed to die or remain alive. Also, Babloo acts with too much haste in trying to get Saheb murdered, thereby jeopardising his own lustful affair with Madhavi because it is clear that Madhavi wants him to continue the clandestine affair rather than settle with him (Babloo). It is not even shown how Babloo would sustain the lavish lifestyle he has gotten used to as Madhavi’s toy boy, once Saheb is no more. In short, Babloo’s assistance in getting Saheb murdered to serve his ulterior motive of having the criminal case against him dropped is understandable but his trying to have Saheb finished to live happily ever after with Madhavi, looks half-baked. The unfortunate part is that while the hook (of his criminal case) exists, the writers have concentrated and given more importance to the other half-baked hook of his desire to spend the rest of his life with Madhavi. In fact, it emerges clearly that acquittal from the criminal case, which was his driving point to get Saheb murdered, has taken a back seat while his lust has become the bigger driving point. And this, even though the criminal case still hangs like a sword over his head. This could’ve been taken care of by showing Madhavi as craving to live with Babloo after Saheb’s murder. In that case, Babloo would be doing what he was doing to be acquitted in the criminal case and to fulfil Madhavi’s desire, and Madhavi would be shown to be manipulative to the hilt. Another minus point of the film is that both the key female characters – Madhavi and Mahuva – in the drama are shown to be women without morals. Since there is no other significant female character in the film, this point is likely to put some among the female audiences off. 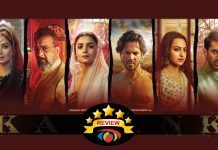 Overall, the plus points of the script are the excellent dialogues and the many twists and turns in the screenplay whereas the minus points are the partly convoluted screenplay and the showing of women in bad light. Jimmy Shergill lives the role of Saheb. He does an extraordinary job, getting into the skin of the character. In one word, he makes the character so believable. Mahie Gill is also superb, using her eyes and body language very intelligently to add to her acting prowess. Randeep Hooda is very good as the scheming paramour of Madhavi, going through his role with ease. Shreya Narayan performs very ably. Vipin Sharma deserves distinction marks for a job excellently done. Deepal Shaw acts with aplomb and wonderfully underplays her character with a rare understanding. Deep Raj Rana is good in the role of Kanhaiya. Rajeev Gupta lends lovely support as the corrupt minister. Sitaram Panchal (as driver Sundar), Sonal Joshi (as Rukma), Mukesh Tyagi (as Jaiswal), Sharad Kakkar (as Tandon) and Kanika Dang (as Saheb’s stepmother) provide able support. Tigmanshu Dhulia’s direction is praiseworthy. It must be said to his credit that he has maintained a fast pace to keep the audience engrossed in the drama in spite of some shortcomings in the script. Music is good and goes with the mood of the film. Jugni song (which reminds heavily of the Jugni song of Tanu Weds Manu) is fast-paced (music by Jaidev Kumar; lyrics by Babu Maan). Love to love you baby (music: Anuj Garg) and Chu chu chu (music: Sunil Bhatia) are also entertaining numbers. 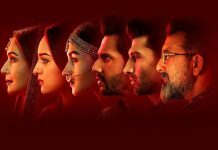 Raat akeli (music: Abhishek Ray), Ankhiyan (music and lyrics by Aarif Lohar and Mukhtar Sohata), Saheb bada hatila (music: Ankit Tiwari) and Main ek bhanwara (music: Amit Sial) are well-tuned. Lyrics are good; all but two songs are penned by Sandeep Nath. Song picturisations are ordinary. Aseem Mishra’s camerawork is good. Action scenes, choreographed by Kaushal-Moses, are okay and should’ve been more exciting. Sets (Dhananjay Mandal) are proper. Rahul Shrivastav’s editing is crisp. On the whole, very moderately budgeted Saheb Biwi Aur Gangster is a fair entertainer but with a few loose ends in its screenplay. It will do fair business at the box-office in U.P., Bihar and other North Indian territories. Its business in the rest of the country will not be upto the mark. Its dialogues and performances are its biggest plus points – and these can prove to be good for augmenting its library value for sale of satellite rights and other electronic rights. this is a fantastic movie not because of script but because of acting of jimmy and randeep hoda . Solid Performance by Jimmy Sheirgill and very good direction by Tigmanshu, Hats off to you both.A must watch with something that is not an easy find in Bollywood movies, “Humor”. Director has done a fab job by letting audiance understand the events and dialogs by themselves. No spoon feeding like our so called mainstream film makers do.